Tray Type Applications range from large power industry to small commercial buildings. Best application is when condensate return is less than 50% and loads are constant. 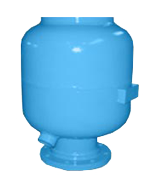 Jet Spray: Most common form of pressurized deaerator. Best stand alone application is less than 30% condensate return and loads that are constant. For system exceeding 30% condensate return, this system frequently is paired with a surge tank. Fuel Oil Filtration Systems: As larger amounts of fuel is being stored for even longer periods of time the need for filtration is even greater. Fuel Oil over time will degrade in two areas. First microbes will grow in the oil which will affect the reliability of the generator itself. Accessories In addition to the above basic building blocks to a complete fuel oil system for your facility. Blowdown Heat Recovery: Industrial grade continuous blowdown heat recovery system. Saves fuel by directing flash for use in the deaerator and transferring heat from blowdown to cold makeup water using a plate/frame or shell/tube heat exchanger. 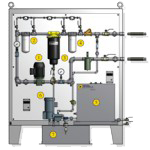 Blowdown Separators: Wilson boiler blowdown systems are built around the Wilson centrifugal blowdown separator. The boiler blowoff is piped tangentially into the separator. In the resulting vortex the pressure is released, allowing the steam flash to rise through the vent while the water and sludge fall through the drain. Exhaust Heads: The use of Wilson Exhaust Heads eliminates objectionable noise created by high velocity discharge of steam, air, or other gases. They also offer protection from exhausted moisture by collecting and draining off liquids entrained in steam vapors. Blowdown Tanks: Wilson engineering builds all sizes of tanks. Condensing Units: National, state and local anti-pollution laws, either existing or proposed, generally include maximum temperature limitations for waste water drained into lakes, streams, etc. High Pressure Condensate Return (HPR): Industrial Steam HPR specifically designed for the corrugating industry. Zero Flash: High Pressure Condensate return systems that conserve energy by pumping hot water directly from the process into the steam boiler.